Adad - God of Weather. - Sumerian God. Adad Ramman is the God of Weather Hurricanes Storms Thunder and Rain. Home ¦ Divinity of the Day ¦ Sumerian Gods and Goddesses ¦ Adad - God of Weather. Adad - God of Weather. Adad (Ramman) is the God of Weather, Hurricanes, Storms, Thunder and Rain. Adad consort was Shala, a goddess of grain. Adad had a double sanctuary in Assur which he shared with Anu. He is depicted with a horned helmet holding lightning and thunderbolts. Often he is shown riding or standing near a bull or lion-dragon. Adad was a god to be feared as well as worshipped, he brings the rain that causes the earth to be fertile, on the other hand the storms he sends out bring havoc and destruction. He is the son of the Moon God, Nanna, and Ningal, the Goddess of reeds. He is also known as the 'Lord of Foresight', being able to foretell the future, and was invoked to preside over haruspicies. 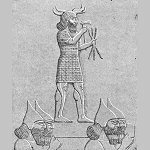 Shamash and Adad were addressed together as the gods of oracles and of divination in general.